just up the pike: and we're back. My desk is assembled, our cable's on and finally, I've been able to get back on the blog again. Given that I now live three hours from the place where I spent the first twenty-two years of my life, it seems appropriate to take Just Up The Pike in a new direction. 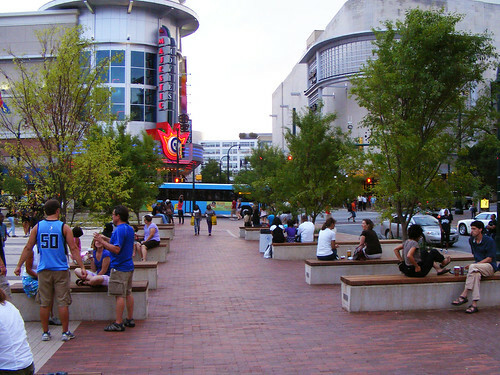 There'll still be generous helpings of Silver Spring, but with a side of something new. In this world, there are cool places and there are lame places. There are places that attract people, are lively and vibrant, and feel unique and special. And there are others still that repel visitors, and are dead and boring. What makes a cool place? The reason why I started this blog four years ago was because I care about cool places, and I want to make more of them. I could rattle off facts and figures and make diagrams and maps about how this happens, but not everyone will understand or, more importantly, care. And that's my new goal for this blog, while I'm living in Philadelphia and going to planning school and unable to be directly involved in what happens at home in Silver Spring: I want to make the making of a cool place as exciting as going to one. It's something I've been thinking about ever since I worked for Councilmember George Leventhal, where one of my many tasks was to study master plans. I broke down all of the jargon and diagrams within these documents and make them legible to my boss, who in turn explains them to his constituents. The most controversial plan I worked on was the Great Seneca Science Corridor, which proposed creating a research center around Johns Hopkins University's campus in Gaithersburg. George and I met several times with Hopkins' representatives, who were struggling to sell the plan to a very skeptical community. They had lots of data - projected traffic counts, revenue totals, and so on - but not much else. Harvard Square in Cambridge, Mass. Crick and Watson discovered DNA while having a beer together, they said. We know that scientists are working all the time - both in and outside of the lab - and we want them to have places to meet and share ideas. Have you ever been to Harvard Square in Cambridge? They asked me. That's what we want to create here. I have been to Harvard Square. It's a cool place indeed, where members of two of the world's most elite universities hang out and/or brainstorm. Cafe tables, a busy subway entrance, and the occasional street performer provide people-watching. It's hard for me to imagine it in Gaithersburg. Armed with a sheaf of Hopkins' own facts and figures, opponents of the Great Seneca plan were able to conjure them into a monster. And Hopkins didn't have any means to fight back. You have to give people a picture, I told them. They don't understand all these numbers you're throwing at them. You have to show them what this will look like, what this will feel like. 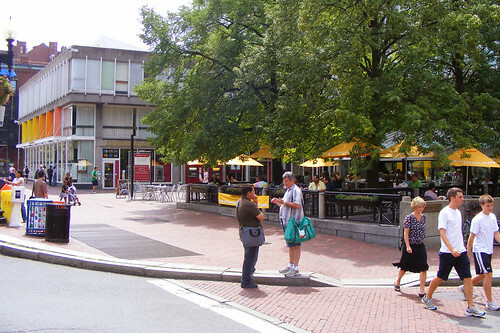 Show them what Harvard Square would look like in Gaithersburg. And even if they aren't convinced, they won't be as scared. Hopkins' rendering of their Belward Campus, part of the Great Seneca Science Corridor plan. Image courtesy of Johns Hopkins University. 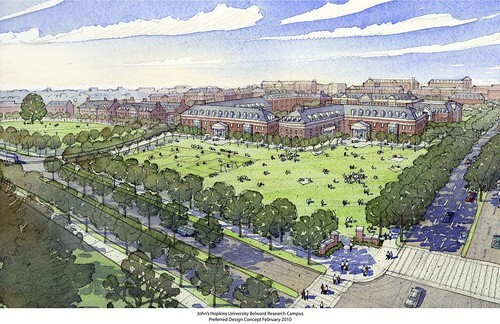 A few weeks later, Hopkins' representatives returned with two artist's renderings of their proposal. And despite continuing community opposition, there was enough support for the plan to get it approved. Everyone, from neighbors to the councilmembers who represented them, had something they could understand, digest, and form an opinion on. Will the Great Seneca Science Corridor become a cool place? It could, if done right. I'd like to talk about that, and about other places both lame and cool, in the blog posts to come. On January 24, 2008 Johns Hopkins posted a notice that they would hold "a series of community outreach workshops and presentations to encourage community feedback and respond to questions and concerns about the planning and development of the Belward Research Campus". Here we are two and a half years later and Hopkins has not yet answered our questions or responded to our concerns. Belward Farm is a historic property listed on the National Register of Historic Places that Hopkins purchased for $4 million instead of its appraised value of over $40 million based on promises they made to the former owner, Elizabeth Banks. Her vision for the farm was a minimally-intrusive Jeffersonian campus which would preserve the legacy of the farm that had been in her family for over a hundred years. Hopkins agreed to her conditions. Then they waited for her to die and changed the entire plan. Belward Farm is not in downtown Boston...it is in suburban Gaithersburg, across the street from three established residential subdivisions. Hopkins has not made any commitments that their proposed high-rise, high-density commercial office complex will bear any resemblance to the drawing. According to the master plan the large expanse they have shown on the corner could be smaller than a baseball diamond. According to the window arrangement shown on the buildings in the drawing, most of the buildings would be about four stories high. In reality, they could be as tall as 100 feet and the tiny buildings in the background of the drawing could be, and we have been told will be, 150 feet tall. Belward Farm rises 50 feet above the corner shown in the drawing so the buildings will appear even taller than 100 or 150 feet. Hopkins has made no promises that the style or height of the buildings will be compatible with the surrounding neighborhoods. If this is to be a world renowned biotech center, how will the pitched roofs in the picture hold the necessary air handlers? Most biotech centers need animal buildings. They have glossed over that saying they will conform to the regulations. There have been no substantive discussions about chemicals or barriers or security or commercial truck traffic or anything really. Hopkins wanted maximum flexibility to do whatever they wanted to do and they got it. They have promised to plant trees on the periphery of the property. That is the extent of their commitments. As for the Howard Hughes Research campus, it is beautiful. It was built to blend with the community and the architecture was site-specific and spectacular. What is not to like? More importantly, they worked with the community to make sure they were "welcomed with open arms". In 1989 when Hopkins bought Belward Farm the residents were excited to have them as a neighbor. Unfortunately, they apparently do not feel it is necessary to BE a good neighbor. The opposition to the size of the development proposed by the Gaithersburg West Master Plan was not limited to a few NIMBY neighbors. There were over 500 people at the public hearings. The opposition included people from over 70 different areas and subdivisions as well as the Sierra Club, Action Committee for Transit and the Coalition for Smarter Growth. It would be useful and most welcome if Hopkins would discuss reality rather than presenting pretty pictures, marketing rhetoric and generalities. For additional background on Belward Farm and the Gaithersburg West Master Plan (Great Seneca Science Corridor Master Plan) see www.scale-it-back.com . Correction: Hopkins paid $5 million for Belward Farm instead of its appraised value of over $40 million. The plan was approved. Clearly, enough people in your community, and the elected officials who represent them, felt good enough about it to support it. Hopefully, you'll be happy with the results. Those of us in East County have been watching the Gaithersburg West debate with envy, and I'm looking forward to having something like it in my backyard. Most of the elected officials didn't care how the existing neighborhoods would be affected by the thousands upon thousands of cars generated by the additional 40,000 workers and 10,000 residents (which, by the way, Hopkins left out of their pretty drawing). County officials saw $$$ but they will have to find $2BILLION to finance the infrastructure that will be needed to support this monster. Smart Growth advocates the repurposing of existing buildings near existing infrastructure and transit. The Corridor Cities Transitway is expected to carry only 12% to 15% of the additional workers and residents, leaving 85% of them in their cars. That will require the widening of the roads to six- and eight-lanes along with the construction of up to five multilevel highway interchanges that will be 10- to 12-lanes wide. All of this in what is now an established suburban residential community. Hopkins was able to convince some of the residents that all will be rosy and everyone will be able to walk and ride their bikes to high-paying jobs...more marketing rhetoric, pretty pictures and fantasy. The reality is that if Hopkins was willing to work with the community and trim back their grandiose over-sized ambitions, we could come up with something that works for everyone, but that is not likely because they too are focused on $$$. "...on June 15, 2009, for the first worksession on the Germantown plan, Board Chairman Royce Hanson was asked a disarmingly simple sounding question: 'Would the upzoning of properties recommended in the revised Germantown and Gaithersburg West master plans absorb all of the current market demand for science and technology space in the county?' He replied that he believed those two master plans would absorb all of the market demand for science and technology space in the county, and not only at present but probably for many years to come, given the current national economic crisis."